For Catholics, the Sacrament of Baptism is the first step in a lifelong journey of commitment and discipleship. 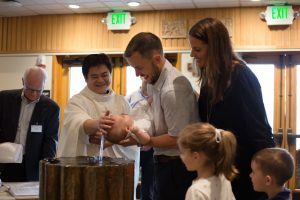 Whether we are baptized as infants or adults, Baptism is the Church’s way of celebrating and enacting the embrace of God. Infant baptism is celebrated at a Sunday Mass upon completion of the parent baptismal preparation process. For more information, please contact Katie Metzger at kmetzger@dsj.org. We understand that you want to cherish the memories of this day through photography. We also want to preserve the sanctity of this special day. Flash photography and many people taking pictures detract from the liturgy and can be very distracting to the community. To avoid this, Holy Spirit Parish has a special set of ministers who work with you, your family and the priest to photograph these memories within the holiness of the sacrament. Our Photography Ministry will use their special gifts to capture all the moments of your child’s Baptism Mass. They will also take family photos and photos with the priest after Mass. Since they have worked extensively with the priest and the liturgist, they can often capture images and memories that no one else can. For additional information, please contact Walter Seepersad at 408-250-0736 or walter@holyspiritpictures.com.